For once in my life, I might be being cool. You see, I've just bought a retro rucksack. 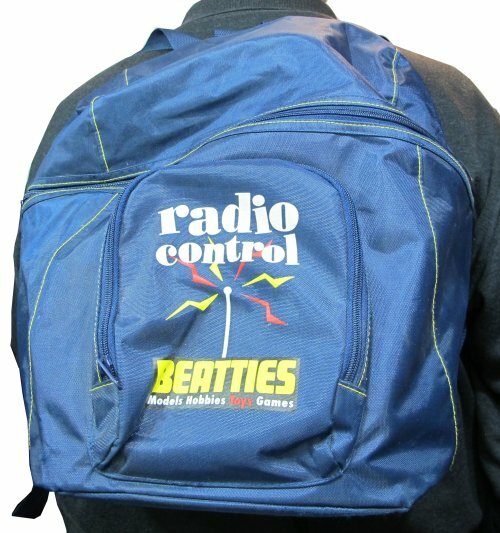 Unsurprisingly, it's a Beatties bag, but doesn't it have a hint of the oh so fashionable retro look? It's actually quite a good bag. The capacity is generous, I'd estimate 35 litres based on my workaday bag. The material is a bit nylony but the shape would accommodate a decent sized box, or boxes of kits. That looks OK - but it would never do at a model railway show. No way. As I understand it, the basic "kit" for any self respecting show visitor includes a full-size, military spec, backpack - complete with frame - and some lengths of Streamline sticking out of the top at odd angles. Standard accessories are reputed to include a pair of solidly constructed boots - preferably complete with steel toecaps - to assist with "gently persuading" other people in the Bachmann scrum to promptly get out of the way, following a "polite request". Seriously though, a noisome minority of show visitors continue to give the responsible majority a bad reputation - a reputation we don't particularly appreciate by the way. Joking aside, I don't doubt that certain gear might come in very useful at a number of model shows - but, somehow, I can't see much of it really being used "in anger". Not by model makers, anyway - most of us are far too polite a bunch for that sort of stuff … .